The Super Bowl is this Sunday. No matter how you celebrate, you need to keep your food safe so you and your guests don’t get sick. Foodsafety.gov is offering tips to keep the food for your bash safe. 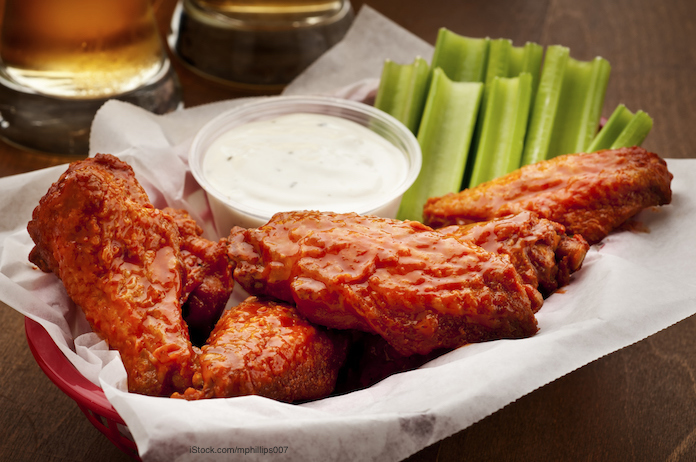 Americans eat more than a billion chicken wings on that day, and many other foods that have the potential to be contaminated with bacteria. If you plan on frying chicken wings, make sure that the frying oil temperature is at least 375°F, measured with a food thermometer, before you start. Never fry frozen chicken wings; they should be completely thawed. Do not rinse the chicken wings before you cook them; that will only spread bacteria around your kitchen and onto you, since the spray from the water can spread up to 3 feet away from the faucet. Pay the wings dry before you put them into the hot oil so the oil doesn’t splatter and burn you. And do not put too many wings in the fryer at the same time. Crowding will reduce the oil temperature too much and the wings can undercook, which means bacteria can survive. It can be tricky to take the temperature of chicken wings since there is so little meat and it’s so close to the bone. To do this accurate, put a cooked wing on a clean plate covered in paper towel. Insert the food thermometer carefully, making sure you don’t touch the bone, which will throw off the measurement. The chicken should be 165°F. Measure several wings from each batch to make sure they are all cooked. If the chicken wings are below 165°F, submerge them again in the hot oil. Make sure that the oil stays around the 350°F to 375°F point. If you are having a buffet, of appetizers or of things like soups and sandwiches, keep hot food hot and cold food cold. Use a heat source such as a crockpot or a warming tray to make sure hot foods stay at or above 140°F. And cold foods need to be kept at 40°F or less. Use ice to keep food chilled. Remember that perishable foods, such as meats, poultry, seafood, eggs, and cheeses should not be left at room temperature longer than 2 hours. Throw them away after this time period. And always wash your hands with soap and warm water for 20 seconds after using the bathroom and before preparing food. Never reuse paper towels. And wash your kitchen towels frequently in the hot cycle of your washing machine to kill any bacteria.